Rain was heavy in Wiltshire County, England, even flooding roads, the first week of August 2009. 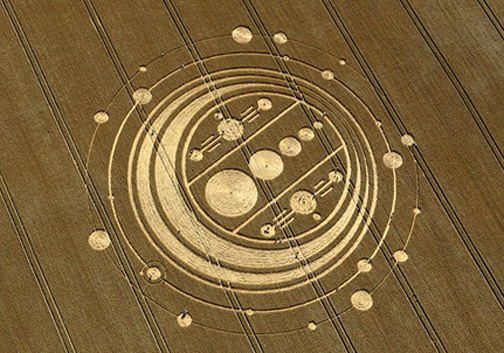 But at Windmill Hill near Avebury Trusloe, a 350-foot-diameter pattern of circles on rings with complex dumbbells in the center was reported on August 6. Aerial image © 2009 by Frank Laumen, VisibleSigns.de. More information and images: Cropcircleconnector.com. August 12, 2009 Albuquerque, New Mexico - I returned from England today with my photographs of the 350-foot-diameter formation at Windmill Hill near Avebury Trusloe in Wiltshire County. There was heavy rain in Wiltshire through nearly every day and night of late July and the first week of August. British newspapers reported that the unrelenting rain was delaying crop harvests in Wiltshire, Devon and other regions of England.